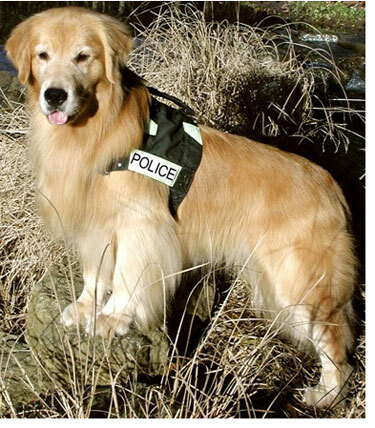 ROBIN IS THE FIRST GOLDEN RETRIEVER IN HISTORY to win the American Kennel Club Humane Fund Award for Canine Excellence (ACE) in Law Enforcement , certified as a working Police K-9 specializing in Human Remains Detection, Narcotics and Mantrailing. Eight-year-old Golden Retriever Robin (Am-Can Ch. Nitro's Boy Wonder SDHF BISS TDI CGC, Police K-9/Search and Rescue Dog) and Mary MacQueen work for the Salamanca Police Department, the Cattaraugus County Sheriff's Office, and assist with searches for the Southern Tier Regional Drug Task Force in Western New York State. In 2009 alone, Robin has been responsible for getting about half a million dollars worth of dangerous narcotics off the streets. Robin and Mary were recipients of the 2008 Police Officer of the Year award for the Salamanca Police Department. In addition to his work in law enforcement, Robin is a therapy dog. And, when his busy schedule allows, he also leads local parades, visits hospitals and nursing homes, and makes trips to schools to educate students about the dangers of drug abuse. During community events and fundraisers, he can often be seen carrying a donation basket or lunch box filled with candy for the kids. Despite his intelligence, perseverance and beauty, Mary notes that temperament is by far Robin's strongest attribute, as noted in her comment below. "Needless to say, I am still reeling from this horrible news. I have our first Oncology appointment on Wednesday at 11AM at Cornell University. They said it is an all day appointment filled with blood work, scans, ultrasounds, and x-rays. The original mass removal was done by my vet, but the histopathology was done at Cornell, so there was probably little room for error in the diagnosis which was Cutaneous Epithelioltropic Lymphoma. They said it was in the early stages for this aggressive form of cancer, so we are confident that this is the ONE special dog who will beat this disease!" The situation is compounded by Mary and Robin's being laid off from the Salamanca Police Department on Oct 11th due to Seneca Casino/NY state budget disputes. Robin has no medical coverage and treatment is both extensive and expensive. He is our latest Working Dog Cancer Treatment Grant recipient, but that only provides for limited assistance, which goes a very short way when it comes to actual costs. Click here to enjoy Robin's growing up years, with videos of him in action. Follow Robin's incredible Cancer Success journey by clicking below . . . . .
We came to know about Mary's exceptional work in 2002 when she shared the story of Golden Working Dog-in-Training Buddy, and continue to be amazed by her strong work ethic. He is a very special Golden Retriever, also the recipient of the 2010 GRCA Gold Standard Award. This award is presented to honor a Golden Retriever who performs honorable, heroic acts or who enriches, inspires or contributes to the lives of individuals and communities. Robin and Mary's work with the Cattaraugus County, NY Sheriff's Office includes jail & vehicle searches, school searches, and searches during community festivals. Robin, the second narcotics certified K-9 in Cattaraugus County, is their first to be allowed to search people/students due to his easy going temperament and passive “sit” alert when he locates drugs. Mary MacQueen and Robin also assist with searches for the Southern Tier Regional Drug task force and Kinzua Search Dogs, a non-profit, all volunteer group that endeavors to locate missing persons. Based in southwestern New York, Kinzua Search Dogs conducts searches in New York State as well as Pennsylvania. 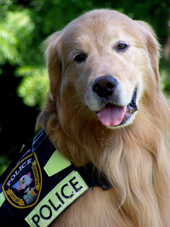 In addition to his work in law enforcement and being a therapy dog, Robin is an AKC Canine Good Citizen, AKC Champion of Record, and the recipient of the Golden Retriever Club of America’s Show Dog Hall of Fame title. As shown in this video, Robin appeared on NBC's Today Show while at the Westminster Kennel Club Dog show with Mary, also of Nitro Golden Retrievers. 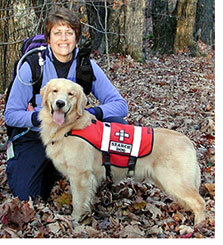 Mary is quite proud of her first trained Search & Rescue gal, Willow, shown here with Mary on the left. A grand lady who is blessed with brains, beauty, bravado and bounce, Am Can Ch Nitro's Blaze Of Glory TDI, CGC is a Golden dream come true. Producing five lovely litters, many of Willow's babies have gone on to greatness in both the show and working arenas. They are proving to be real chips off the old block in both her beautiful type and wonderful temperament. Mom to Robin, you can see that the line continues to produce exceptional working dogs. Robin completed both his American and Canadian Championships at less than two years of age. As a puppy [2002 to 2003], he was always an over-achiever, earning many Best Puppy and Puppy Group placements in the conformation ring. A multiple group placing Golden, Robin achieved his Show Dog Hall of Fame status by three years of age. 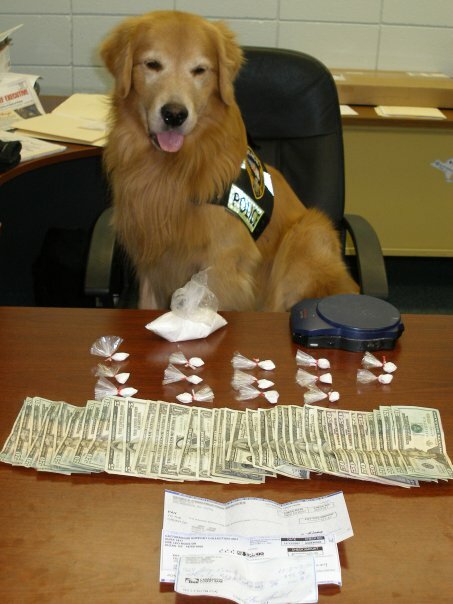 Yet, during that period, he also found time to become certified as a working Police K-9 specializing in Human Remains Detection, Narcotics and Mantrailing. With drive, self-confidence, intelligence, and a willingness to please, Robin has proven to be an exceptional working K-9. He started his scent detection work at a mere seven weeks of age, and has built a strong foundation and true passion for search and detection work. 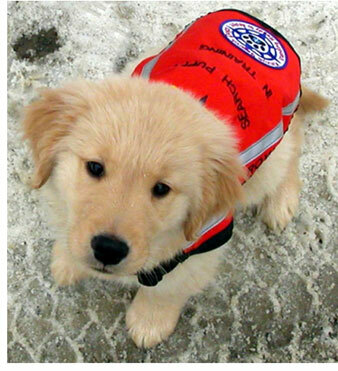 Don't you just love this photo of Robin at 10 weeks of age, already gearing up for his important job ahead? While still in the Imprinting Window, Mary exposed Robin to the distinctive odor of decaying human remains, a critical component for dogs that who do this type of search work. Although pups do not yet have the skill to search in earnest for scent, they are drawn to the smell of decay. Robin also did well when Mary did puppy runaway games with him, a foundation to Mantrailing (finding person whose scent matches a human’s scent-sample that dog is given) and Air Scent training. Air-scent dogs work with their nose in the air. They pick up human scent anywhere in the vicinity—they don't need a last seen starting point, an article to work from or a scent trail, and time is not an issue. Whereas tracking dogs follow a particular scent trail, air-scent dogs pick up a scent carried in air currents and seek out its origin—the point of greatest concentration. In the puppy runaway game, the owner restrains the pup while someone shows him food or toys and then runs for cover. Although the puppy is permitted to see the person run off, s/he rather quickly disappears from sight, pups thus learning to use their nose to find them. Typically, small pups have little desire to find anyone but their owner, and certainly not for any great distance. However, Robin, did not like being separated from a favorite toy, and eagerly ran after the victim to claim his reward. Due to a serious illness, Mary was derailed for a period of time from training with Robin. But, it did not seem to hold him back at all. 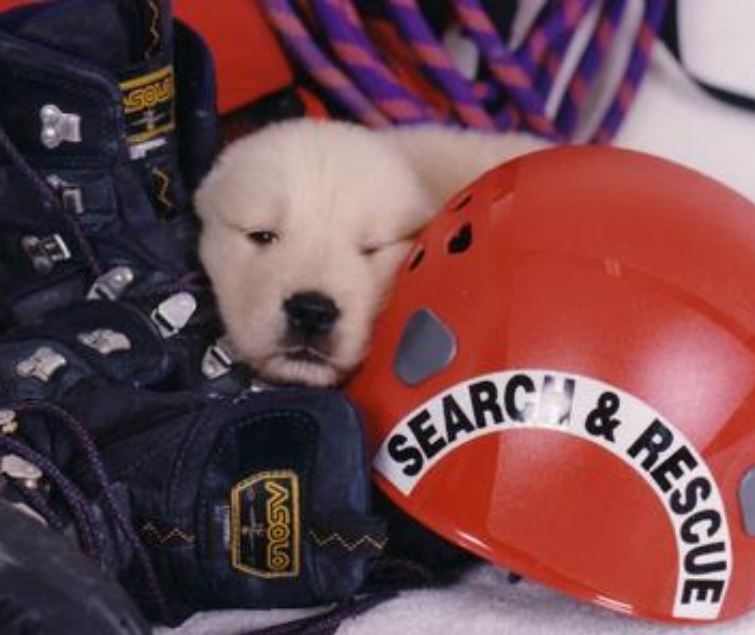 In 2004 at the Extreme K-9 Training Academy in Southern Illinois, Robin’s formal search dog training was begun in Mantrailing, Article Search (finding a lost item that bears human scent), and Human Remains Detection (locating a deceased person). Given the early exposure to human remains odor during Robin's Imprinting Window, the scent was immediately recognizable to him allowing for his training to quickly progress. Learning that the odor he was sent to find could be old or fresh, buried beneath the surface, high up in the trees, in water, or just bleached out bones, Robin came to understand the nuances of Human Remains Detection. In early 2006, Mary returned to the Illinois academy to introduce Robin to his Narcotics Detection training. The early scent work that she had completed served to be a good foundation, with Robin quickly learning to detect the odor of narcotics. Be sure to read the fabulous Golden Retriever Club of America Golden Retriever News article, A League of His Own, written by Behesha H. Doan of Extreme K-9 Training Academy. And, check out Robin's webpage at Nitro Golden Retrievers. Mary MacQueen has trained several Goldens for working fields, and in the Spring of 2002, put out a call looking for a potential narcotics or explosives dog to train for Kinzua Search Dogs and Phillips Command Dogs. Susan Still of Michigan's Foxboro Golden Retrievers thought she had the perfect candidate to become a great working dog. Mary allowed us to share the wonderful progression that a dog takes in becoming a true working dog, with a 2-year-old dude named Bubba, who became everyone's "Buddy." You can follow that story via the following 10 chapters, to get a real idea, of all the work involved, in this important field.